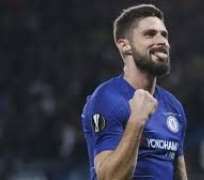 Chelsea thumped PAOK thanks to two wonderful goals from Olivier Giroud, while AC Milan came from behind to thrash Luxembourg side Dudelange. Over in Kievm, a young Gunners side put on a show to down Vorskla Poltava in temperatures that dropped as low as minus 10 degrees. Here's a wrap of all the Europa League action! Chelsea maintained their perfect record in Europa League Group E with a 4-0 win over PAOK, who played for 83 minutes with 10 men. Chelsea were rarely made to come out of second gear the moment Yevhen Khacheridi was sent-off early on for a professional foul on Olivier Giroud. The striker then went onto help himself to two goals and Callum Hudson-Odoi netted his first ever senior goal on a rare start before Alvaro Morata scored late on. AC Milan were given a helping hand by two own goals as it survived a big scare before beating Dudelange of Luxembourg 5-2 in the Europa League. The Italian heavyweight levelled with an own goal from Stelvio Rosa da Cruz in the 66th minute and four minutes later Hakan Calhanoglu made it 3-2. Tom Schnell also put through his own net with 13 minutes to go before substitute Fabio Borini finished off Dudelange. Arsenal have secured top spot in Europa League Group E after a comfortable 3-0 victory over Vorskla Poltava in Kiev. Thursday's fixture was moved 300 kms east of Poltava to the capital's Olympic Stadium, with parts of Ukraine under martial law as political tensions with Russia continue to rise. Any inconvenience for Gunners coach Unai Emery and his players did not show as youngsters Emile Smith Rowe and Joe Willock scored either side of an Aaron Ramsey penalty to confirm a win for the English Premier League side in temperatures that dropped as low as minus 10 degrees. In Norway, Tom Rogic's Celtic scored a 1-0 win over Rosenborg to secure second spot in Group B behind Salzburg who were 1-0 winners over RB Leipzig. The Socceroo played the full 90 minutes as Scott Sinclair netted the all important goal in the 42nd minute. A lofted cross found the Englishman at the back post who nodded the ball past the helpless goal keeper to secure his side the victory.